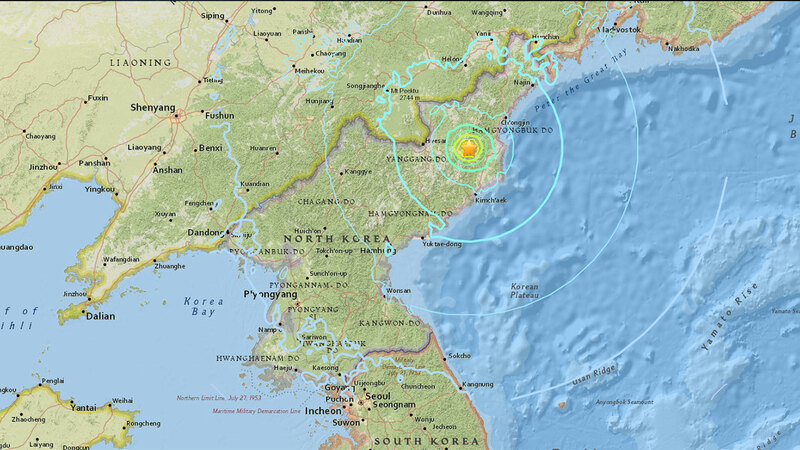 SEOUL, South Korea -- South Korean officials say they have detected an artificial 5.6 magnitude quake in North Korea and believe it marks that nation's sixth nuclear test. The Joint Chiefs of Staff in Seoul says in a statement South Korea's military has strengthened monitoring and readiness and is mulling a variety of possible responses that could be pushed together with its ally the United States. South Korea's weather agency said Sunday the unusual seismic activity occurred in Kilju, northern Hamgyong Province. The U.S. Geological Survey called the quake an explosion with a magnitude 6.3. A second quake measuring 4.6 magnitude was detected a short time later, according to South Korea's Yonhap news agency. North Korea conducted its fifth test last year in September. If confirmed, the latest test would mark yet another big step forward in North Korean attempts to obtain a nuclear-armed missile capable of reaching deep into the U.S. mainland. The apparent test came just hours after North Korea claimed that its leader has inspected the loading of a hydrogen bomb into a new intercontinental ballistic missile. The U.S. State Department had no immediate reaction. North Korea conducted two nuclear tests last year and has since maintained a torrid pace in weapons tests, including flight-testing developmental intercontinental ballistic missiles and flying a powerful midrange missile over Japan.